Discussion in 'V7/V85/V9 Chat & Tech' started by DETRoadster, Dec 20, 2018. DETRoadster Tuned and Synch'ed GT Site Contributor! 1) Check for exhaust leaks at the heads causing a lean condition. 2) Swap fuel injectors left to right and see if the problem follows the injector. 3) Swap O2 sensors left to right and see if the problem follows the O2 sensor. 4) Connect my wideband O2 reader to each O2 sensor and check for differences in AFR. 5) Remove injectors from intake but leave electrical and fuel connected, place injectors in jars, crank engine over for 10 seconds, weigh the fuel dispensed into the two jars and note differences. Am I missing anything? Any other words of wisdom from folks who have been down this road before? Thanks! I'd start by putting in new spark plugs. Great idea. Thank you. I was so hyper focused on fueling that I didnt think about spark. A fresh set of plugs is a pretty easy thing to try. While doing that check the plug wire & caps, some ground to covers. Poppe and DETRoadster like this. Good call, thanks! Keep the great ideas coming, fellas. I really appreciate it. I've got all next week off so there's plenty of time to tinker in the garage and get to the bottom of this. I'd say plug caps as v700steve suggested. Hmmm, can you guys help me understand "plug caps"? Are you talking the decorative black plastic piece that snaps into the center of the valve cover and hides the plug and plug wire? EDIT - Ah, I think I've got it. Googled Moto Guzzi Spark Plug Cap and I think what you all are talking about is what I'd commonly call a spark plug wire "boot." The 90 degree plastic overmold that covers the connection between the sparkplug and the conductive end of the plug wire. I'll be sure to check that out. Thanks for the tip! It looks like it's grounding out through the insulation and through the gray protective sleeve. 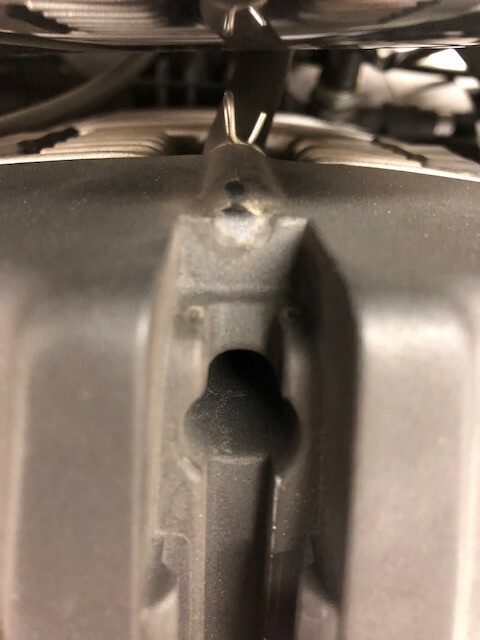 The big burned area on the left is where the wire crests over the top edge of the cylinder head, the next burn mark is where it lays next to a clamp on a hose. The last burn mark is where it touches a cooling fin on the head. What baffles me is that the insulation does not look compromised. It looks like it's grounding out but the insulation looks totally intact. Yes the gray sleeve is worn through on the left side of the photo but the insulation on the wire underneath looks A-OK. What gives? Here's where the wire crests over the back of the valve cover. You can see evidence of grounding out here too. Hoping someone here can explain what I found because Im baffled! Don’t be too baffled. IMO, this is the type of problem that arises when all of the old school engineers are dismissed in order to bring in younger/fashionable ones. To me, this is a major design flaw folding the plug wires over the valve cover like that. Don’t feel alone, it’s happened on many. I keep a handful of plug wires in stock at my shop. I also recommend checking the inner rear flange bolts on the rear drive. More than most have been delivered finger tight on ‘13-16 V7s. Poppe, DETRoadster and V700Steve like this. There you have it!! AND sourcing parts from the lowest bid. Why would you need a shield if they were good wires? You found the problem, now get good wires and plug caps & you'll be good. GT-Rx® and DETRoadster like this. 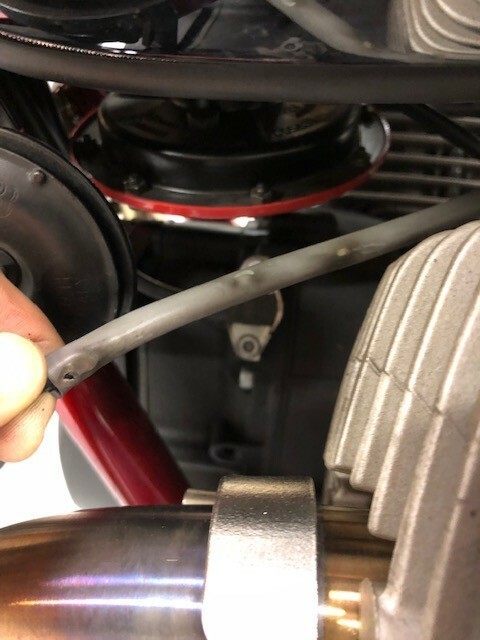 On my Griso 1100, which originally ran the outer plug wire over the top of the head, I installed different valve covers and different plug wires that ran the outer plug wire around the head like they used to do. Poppe and V700Steve like this. What baffle me is not the routing over the valve cover but that the wire shows signs of grounding out, even though the insulation under that gray sleeve looks to be in perfect condition. Makes no sense! But none the less, it's a relatively cheap and easy part to replace so out with the old wires and in with the new. Indeed! Thanks for the tip. it was the very first thing I looked at, based on your comments. The composition and thickness of the insulation can be such that it passes very high voltage even though it appears unbroken. High voltage requires thick insulation. Interesting! I never knew that was even possible. Thanks! I have new wires, caps, and plugs, arriving tomorrow. Fuel injectors are out with RC Injection for cleaning and flow testing. Hoping to get the Guzzi back on the road this weekend, weather permitting. Until then, I'm stuck riding my wife's Honda Monkey to work which is equal parts hilarious and terrifying. Hey, I see you are in NH. What part? I lived in Nashua for 6 years. I never heard of a Honda Monkey until now. Looks like a riot! Currently in Hollis. Also lived in Nashua for decades. If you cut away the thin grey sleeve, you will see that the plug wire itself has been worn thin, likely down to the core wire. It will arc through the sleeve as you show. I think the sleeve was put on to keep things simple (at quick glance) for assembly at the factory, as only one side has it. That Honda Monkey looks like a 70's Rupp mini bike on steroids!!!! Bingo! You are correct, Todd. Wire was totally shot under that sleeve. The mystery deepens unfortunately. I sent both injectors off to RC for cleaning and flow testing. Put them back on the bike today along with new plug wires and caps (upgraded V7 II), and new spark plugs. So, fresh caps, wires, spark plugs, and injectors. Took the bike out and within 500 feet I could tell it was still having problems. Still misfiring badly at light throttle. My low fuel light was on and I realized I failed to refill the tank after having drained it when pulling it to replace the plug wires. Fuel starvation maybe? Headed home and gassed up. Took the bike back out and Holy heck, NOW I see what everyone is gushing about with your ECU tune and exhaust. The bike was magic. Sounded amazing, pulled like a freight train. A totally transformed bike. I didn't want to get off it. Rode it for about 3 miles enjoying every moment of it...Then the misfire came back! Gahhhhh!!!! What the heck. Rode the 3 miles home with it missing badly at light throttle. Goose the throttle and it gets much better but does not have the sound and power that it had when it was running right. I'm stumped at this point. Bad coil maybe? Is it possible to get an air bubble stuck in the fuel system? I had that all apart to replace the plastic filter. Read the error codes with the flash tool. Likely not a coil. The plug wires are friction fit into the coils. My bet is one or both aren’t fully seated.